The battle is officially underway. "The Voice" kicked off its second level of competition last night with coaches Adam Levine, Blake Shelton, Cee Lo Green and Christina Aguilera selecting two artists for an onstage singing battle. The winner remains on the coach's team, the loser goes home or gets an opportunity to be snagged up by another competing coach. While we have seen the format before, a couple new additions come to this season: the new guest mentors and... strategy! OneRepublic's Ryan Tedder (Team Adam), Miguel (Team Cee Lo), Ed Sheeran (Team Christina) and Cher (Team Blake) made their "Voice" debut, advising contestants on how to best perform for their first battle. Once the singing gloves were put on, coaches got ready with their game faces, and one had thing in mind — winning. Some made particularly strategic moves in keeping and stealing artists. The first battle took place between Team Adam's Grey and Nic Hawk (the one that hit on Levine during blind auditions). The duo set the bar high for the night with Tedder calling their rehearsal of Jessie J's "Dominos" a "9.9." Once they hit the stage, Grey's beautiful tone fought to keep up with Hawk's super energetic performance. The coaches were split in their picks with Green and Shelton opting for Hawk. "The value of somebody like Nic is priceless," Shelton said. And when Levine picked Grey to stay on, the country star jumped on that steal in no time. "Oh, Adam you screwed up so bad!" he shouted as he nabbed a unique member for Team Blake. One of the night's best battles came from the younger talent: Team Cee Lo's Caroline Pennell and Anthony Paul. Their beautiful and dark rendition of Justin Bieber's "As Long As You Love Me," showcased Pennell's amazing texture and emotion, as well as Paul's spot-on tone and range. 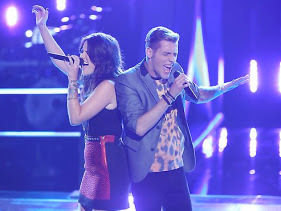 The neck-and-neck battle left Xtina feeling "torn" and while Green commended Paul, he said Pennell, "encourages me to dream with my eyes open," choosing her as the winner. But Aguilera swooped up Paul, in the second steal of the night, applauding his "vocal control" at such a young age. The final steal of the night came from Team Christina's battle pairing of Brianna Cuoco and Jacquie Lee. The pair took on "House of the Rising Sun," and stood up well against each other. Although it seemed Cuoco had it in the bag with the genre, Lee excelled during the battle with her "youthful spin" on the rock song. Shelton thought Cuoco captured the essence of the song, but Aguilera choose to move Lee forward. Another battle ensued as Green and Shelton then fought for the steal, with Levine siding with Green, shouting to Cuoco, "Don't make direct eye contact with the dimples," speaking of Shelton, but it seemed they were too cute to resist and she landed on Team Blake. 17 year-old Amber Nicole and 15 year-old Timyra Joi of Team Christina were some of the youngest contestants to go head-to-head. Their rehearsal of Beyoncé's "Listen" left guest mentor Ed Sheeran speechless. The girls' beautifully emotional performance made coach Aguilera cry. "That's a win right there, making her cry," Shelton pointed out. "If I were up-and-coming and on the scene, I would be scared right now," Aguilera added before announcing Nicole as the winner. To narrow the country playing field, Team Blake paired Justin Chain and Shelbie Z against each other. During rehearsals the pair was struggling with pitch and harmony issues, unable to truly connect to each other as they sang the love ballad "Don't You Want To Stay." Cher at one point even told Chain to dig deep and find the power or be lost by Shelbie. But boy, did the pair step up their game during their performance, with Xtina calling them a "great duet pairing" and Adam saying, "The best battles are the ones that don't feel like that." A conflicted Shelton found strengths in both artists but opted to keep Shelbie Z. Team Adam gave, potentially, the best battle of the night when pairing 54 year-old Donna Allen with the young Jamaican Tessanne Chin. Early on, Tedder advised Chin to rise above her background singing roots saying, "If you take a backseat to Donna, she will steamroll you." When the battle began, everyone's jaw dropped. Shelton called it "epic," as a stunned Xtina had to ask Allen, "First of all, are you Tina Turner?" Although both were "world-class singers," Levine chose Chin as the winner, leaving Allen disappointed who was trying to represent for the more mature generation. Battle rounds will continue Tuesday (October 15) night, and season five inches closer to finding its "Voice."